Paxos belongs to the Ionian island group and lies below Corfu and above Lefkada. Together with the uninhabited island of Antipaxos, it is sometimes commonly referred to as Paxi. Although small, Paxos has majestic appearance maybe due to the Venetian-influenced architecture of the Ionian sea, or because of the luxury yachts moored at the promenade of Gaios, the main village. How to describe Paxos in three words? Paxos has no airport, the closest is on the neighbor island of Corfu. It can be reached via regular ferry connections from the town of Igoumenitsa on mainland Greece (both for cars and passengers), or from Corfu (passengers only). The journey from Igoumenitsa lasts about 2 hours. Another way to see Paxos is by a daily boat trip from Parga and Syvota. 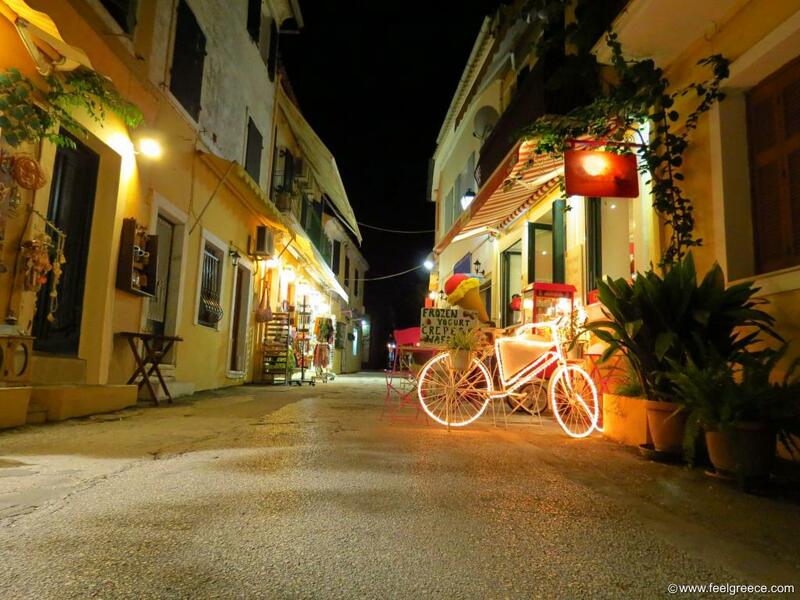 Gaios is the main village and port of Paxos, followed by the north village of Lakka. Both are good to stay at as they have plenty of eating options and nice promenades where you can wander in the evenings. Longos is a small fishing harbor which also has some night life and accommodation options but it is much quieter. Populated inland villages are Magazia, Bogdanatika and Ozias. Looking at Paxos on the map you will see many other names marked as villages, all ending in "tika" like Aronatika and Manatika but they are not real settlements. Some of them consist only of a few ruined houses along the road, or a few renovated old houses, or nothing at all. Namely some of the renovated old houses are turned into luxury villas and cottages to rent, guaranteeing privacy and isolation, yet only minutes drive from the lively Gaios or Lakka. Are there nice beaches on Paxos? That is very subjective. If you are fans of soft sandy beaches, beach bars and water sports you will not like them because nothing of these is presented. 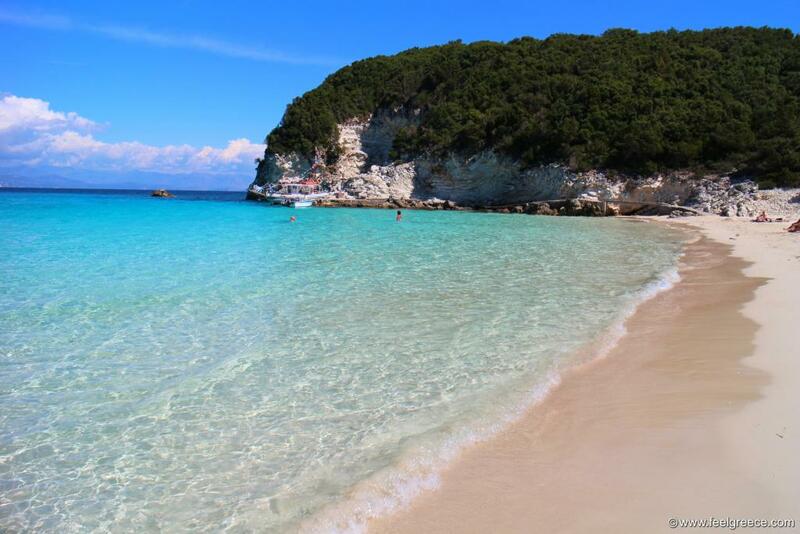 All beaches of Paxos have small or big pebbles and stones, excluding Mongonisi islet which has a miniature sandy spot. As a compensation, the water is blue and transparent and there is no chance of crowds. The east coast is dotted with isolated tiny coves between the settlements, some of them visible from the road and easily accessible via short paths, like Defteri, Plakes and Stafioucha. There are a few small beaches in the main villages as well - the beach of Gaios is called Gianna, Lakka has Kanoni and Harami, and next to Longos is Levrechio. Kipiadi and Orkos are the largest in size, both accessible via dirt road and on foot. The quaint Erimitis is a place where you should go for the sunset. The only beach which provides some facilities is Monodendri - it has a beach tavern, sunbeds and parasols. Speaking honestly, the best beaches of Paxos are on Antipaxos. 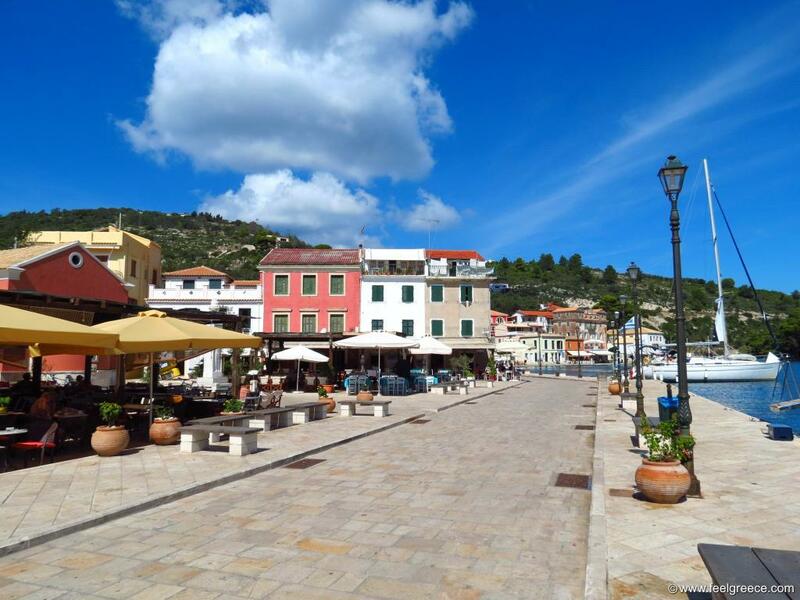 What to see on Paxos? - Antipaxos island. It is not inhabited and it always goes hand in hand with Paxos. - Erimitis, a beach which appeared after landslide in 2007 and the scattered rocks pieces are still there. The sunset from Erimitis is very dramatic. - Mongonissi island - the southernmost part of Paxos is in fact an islet but it is connected to Paxos via short causeway. Mongonisi has only one tavern by the sea and a very small sandy spot used as a beach. The water there is very shallow and calm. 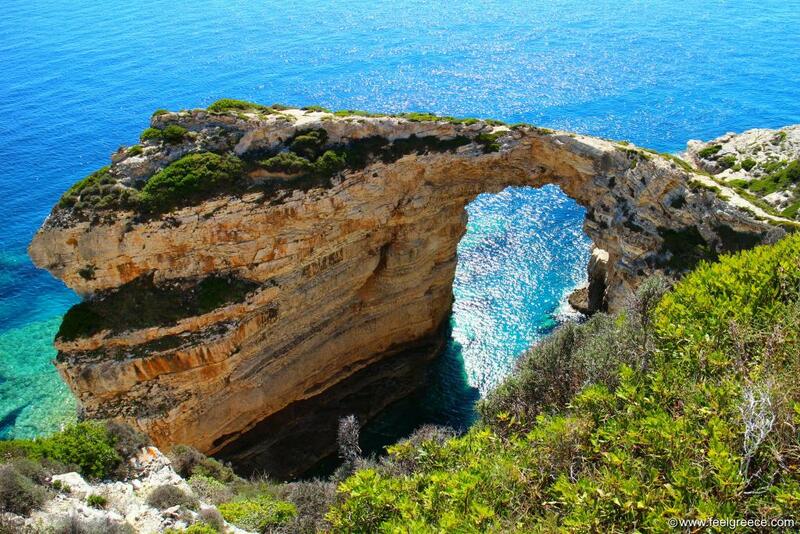 - Tripitos, also called Kamara - a huge natural sea rock arch. 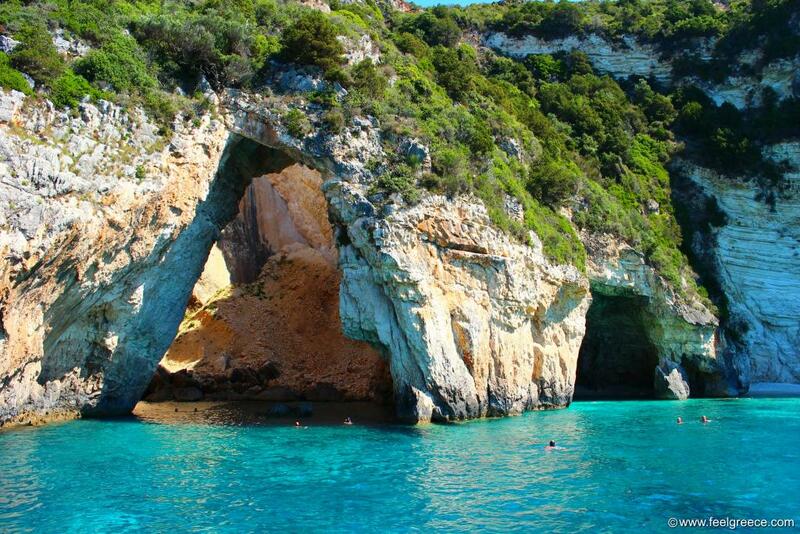 It can be seen during the boat trip around Paxos but you can also visit it on foot. What activities to do on Paxos? - Do a daily boat trip around the Blue Caves and the island - most boats depart from Gaios but there are options from Longos and Lakka as well. - Take a boat taxi to Antipaxos - takes only 10 mins from Gaios to Vrika beach. You can go in the morning and return in the afternoon with the last boat. - Have a drink at the small square next to the fish market in Gaios - there you will find a few traditional bakeries and cafes. 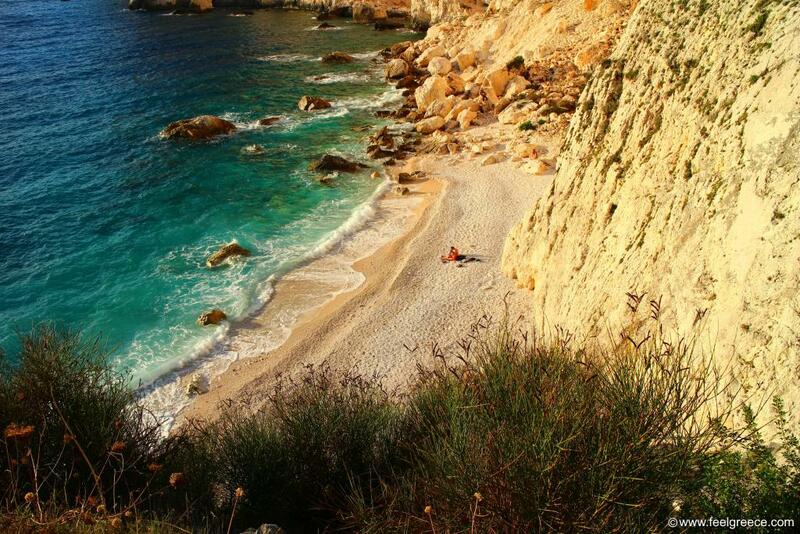 - Visit the islets of Agios Nikolaos and Panagia, located in the middle of Gaios harbor. They are so close to the promenade that the journey by boat takes only a few minutes. On the top of Agios Nikolaos you can see the ruins of ancient fortress. 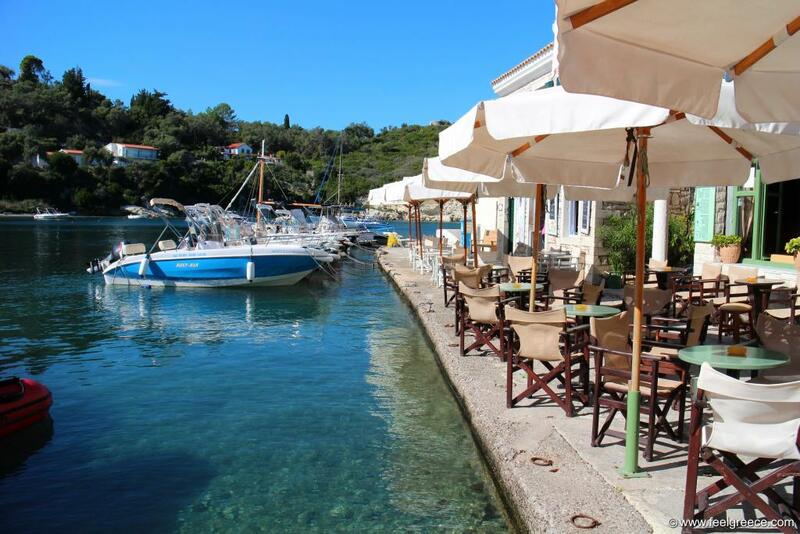 What to eat on Paxos? The local cuisine of Paxos is very much similar to those of Corfu, its specialties being stifado (veal cooked with wine and garlic) and bourdeto (fish with tomato sauce and peppers). Dishes like pastitsio and moussaka also have a slight difference in taste, due to the local herbs they put inside. We spent one day on a boat trip to the Blue Caves and Antipaxos and we did not regret it. We had the chance to swim inside some of the caves, to go into others with the boat and to take glimpse of Erimitis landslide from the sea. 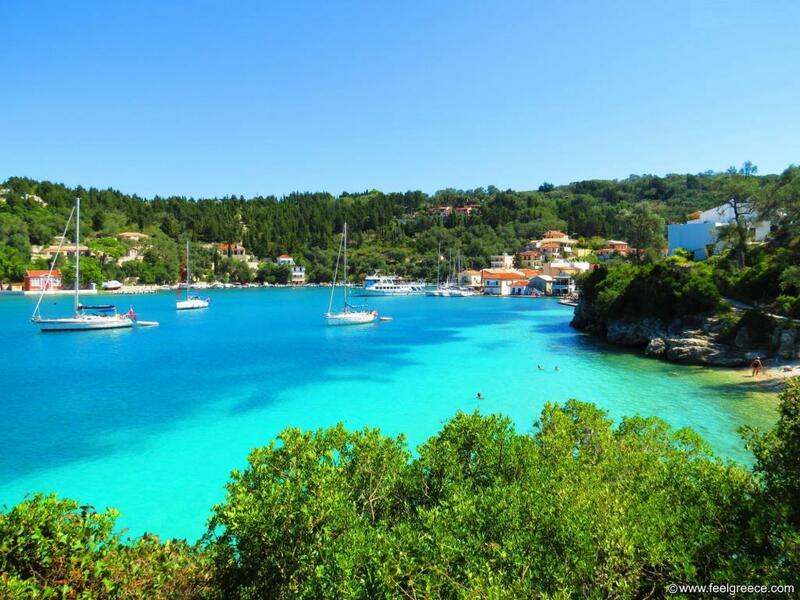 Antipaxos is a must, the sea has such unique color that it looks unreal. 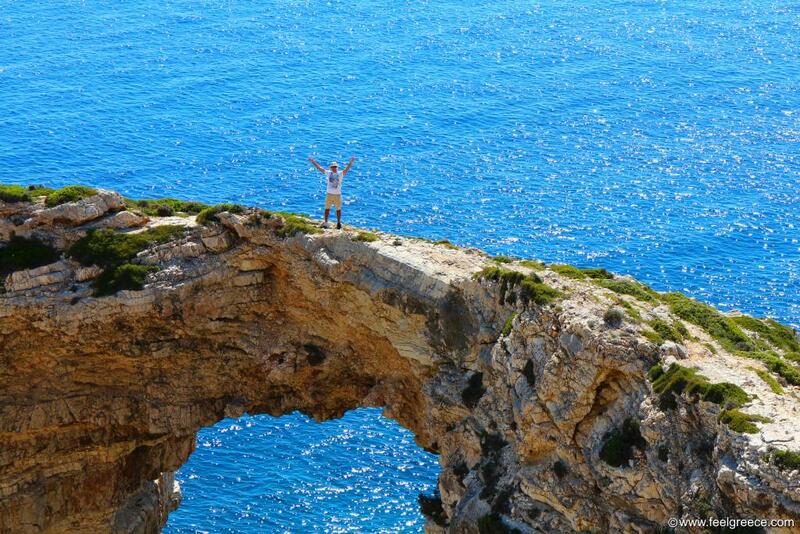 But our most memorable experience on Paxos was the walk to Tripitos arch on foot. We need to admit here that we took the wrong direction a couple of times after we left the car but there were no signs (in our gallery of Tripitos you can see the correct route). The navigation insisted us to pass through roads closed by private residence. Finally we managed to get to the arch and its surroundings and it was spectacular: we could see the entire Antipaxos in the distance, and right next to the arch we noticed another weird rock formation - something that looked like giant flippers plunged into the sea. Tripitos itself was very imposing and a bit frightening. At first sight it looked very narrow in the part above the sea but when we carefully approached it, we could see it was terraced at the back and it was wide enough to walk on the top of it (yet attention is required). Some of the boat trips pass very close by Tripitos and even stop for a swim but the feeling to see it from the land is different and much more thrilling.